Columbia, the capital city of South Carolina, could really use a change of topic when it comes to flags. As the focal point for display of the Confederate Battle Flag in the South, the city hosted a turning point in the fractious debate, with the removal of the flag from the Confederate Monument in front of the capitol, in July 2015, by order of Governor Nikki Haley. Calls for the flag’s removal had intensified since the murder of nine people in the Charleston church shooting the month before. The flag had flown from a pole next to the monument, surrounded by a concrete deck and a small fence. Within a day of the decision to remove it, all of that was gone and sod was being laid in its place. The most visible event associated with the flag was its lowering two weeks before as an act of civil disobedience by a young African-American filmmaker, Brittany Ann “Bree” Newsome, whose pole-climb went viral and won praise from Democratic presidential candidate Hillary Clinton. I visited Columbia in 2009 in conjunction with NAVA 43 (Charleston), and then again this year. That provided an opportunity to see the monument before (with flag) and after (without flag). The Columbia Design League and the local arts-commission equivalent had invited me in September to speak about flag design and how the city flag might be improved. 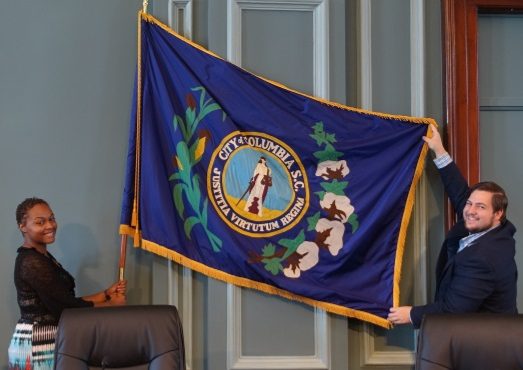 Columbia’s flag has served the city for more than a century, but it represents a bygone era (corn and cotton) with an outdated, ineffective design (a seal on a bedsheet). 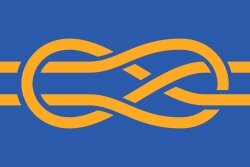 Local leaders have begun an effort to consider updating the flag as part of reclaiming civic pride and improving the branding of the city. A large group came together at the Columbia Museum of Art for a workshop to learn about flag design and discuss ideas for change. Perhaps this new flag topic will bring positive attention to Columbia. It may well show how flags are far more than designs on bits of cloth, and can serve a community as a unifying symbol. Columbia’s media relations staff show the flag in the city council chambers. Adopted in 1912, it features the city seal and stalks of corn and cotton. 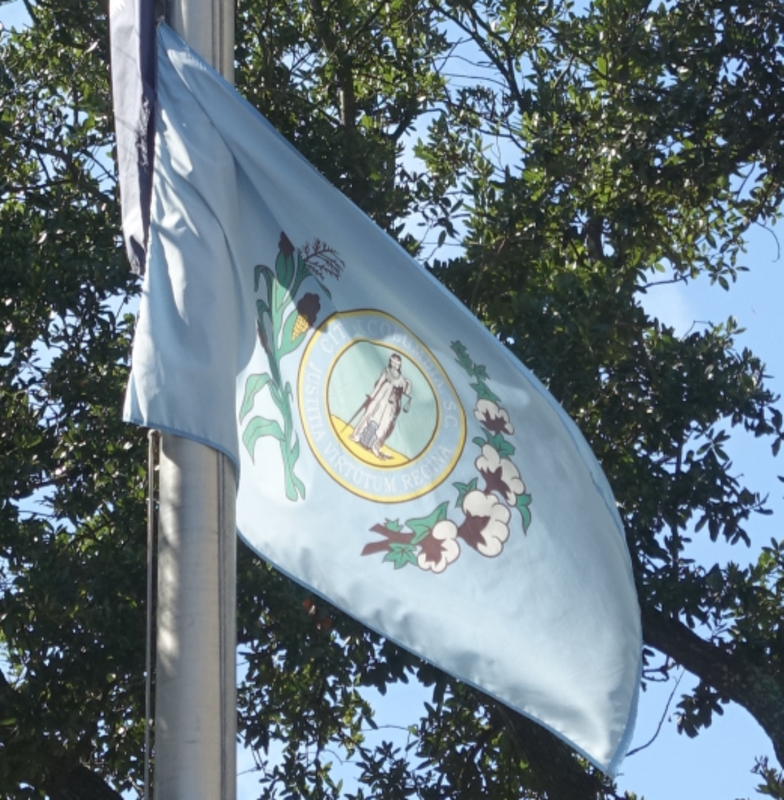 A light-blue version of the Columbia city flag flies below the state and national flags outside City Hall. 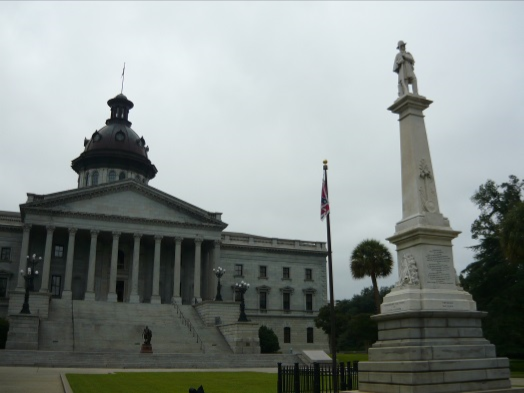 The South Carolina State House and Confederate Monument, 2009: Flagpole and fencing in place. 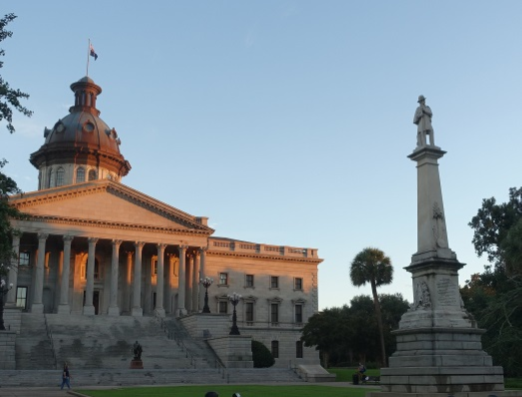 The South Carolina State House and Confederate Monument, 2016: Flagpole and fencing removed.